Hey, friends! 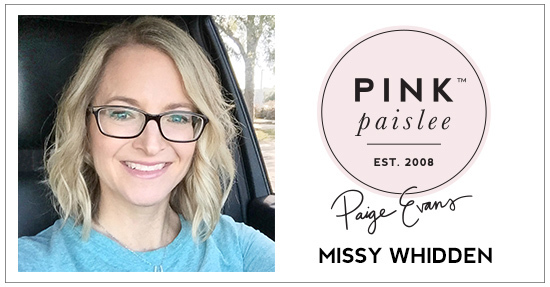 Happy Tuesday :) I'm back today with a new layout for the Paige Evans Design Team. Have you ever used one of Paige’s cut files as a stencil? That’s what I did on this layout using her Flower cut file. It’s a simple flower, but I duplicated it in several sizes and made a vertical design. I cut it on white cardstock using a Silhouette Cameo and then scraped modeling paste over it. I used a fun multi-colored paper from the Fancy Free 12x12 Paper Pad as my background and faded out a lot of the pattern with white gesso. Once the paste dried, I used some bold ink sprays to add in lots of red, pink, aqua, dark blue, and yellow. These colors match the Pick-Me-Up collection perfectly. I don't think I could ever get sick of using any embellishments with gold foil. I love how it shines in the light! I decided to use the dark blue Mini Thickers here instead of the white. I think the white would have really stood out too much. I did wind up tracing around parts of the letters with a gold pen. Texture and dimension here...I love how it turned out! My favorite thing about modeling paste is how the color just runs and blends around the shapes. It really does all the work for you. And I was able to stitch around the centers with no problems once it was completely dry. I get a lot of questions about what type of pen I use for journaling. My black pen is a fine tip Sharpie...nothing too fancy. I have to be careful and not press too hard when I'm writing over gesso. I honestly have ruined many of these pens, but I just try and write softly to make them last. I can't get enough of the rich and deep colors in this collection. They inspired me to create a fun and rich background to match! Here are a few more close-ups because I tend to take a lot...haha! If you want a new idea on stencils, give this fun cut file a try. Paige has so many cut files that would make awesome stencils! I hope this inspires you and gives you some ideas for your next layout. I think the tissue paper behind the pictures is genius! Beautiful LO!